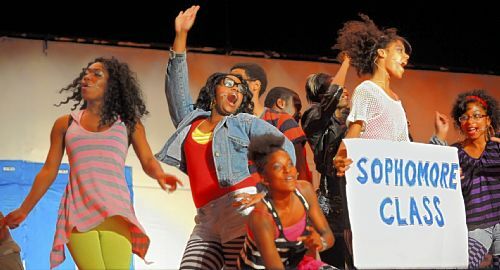 Members of the Westinghouse High School musical, "Fame Jr.," the school's first musical production in a decade. With a boost from members of the community and a national program, two dozen Pittsburgh Westinghouse students achieved "Fame" last week, when the school presented its first full-fledged musical theater production in a decade. Westinghouse was among 20 schools chosen in a nationwide search for Phase One of "NBC's 'Smash': Make a Musical" program, an outreach project of the TV show about the making of a Broadway musical. The program sends representatives from the company iTheatrics to conduct on-site workshops aimed at jump-starting a musical theater event, and building self-sustainable programs within the schools. "I see it as a potential game-changer for students who all of a sudden see themselves in a different way after they've gone up there and done something like that," said Richard "Muzz" Meyers of Community in Schools, who with Kelly-Strayhorn education director Dan Derks was instrumental in building toward the Westinghouse performance May 18. Other local connections included Tamara Goldbugen, project adviser from the University of Pittsburgh, and musical artist Bridgette Perdue, who directed the show, plus strong support from the Homewood Children's Village. The play involved a cast of 13 and 10 more involved in lighting, sets and crew. Students worked three days a week after school for four months to prepare the evening show, plus a students-only matinee. "It exceeded my expectations," Mr. Meyers said of the results. "It was wonderful for the students and for the community, and everyone could see the potential to keep it going." He and Mr. Derks had been talking for some time about trying to get a musical going at Westinghouse and the NBC program helped raised the level of enthusiasm with the school's students and administration. "The Kelly-Strayhorn has been looking for ways to re-establish the arts culture in the East End that produced artists like Gene Kelly, Billy Strayhorn and Ahmad Jamal. So partnering with the 'Smash' program aligns with our goals within this national opportunity," Mr. Derks said. "This will be the first musical at Westinghouse in 10 years. To see the kids sticking with it and working so hard and enjoying themselves is huge." Cindy Ripley, a New York-based educational consultant for teachers and students in musical theater for more than 30 years, holds the title master teacher of iTheatrics and was the company's representative at Westinghouse, visiting during the launch of the program and once more when rehearsals for "Fame Jr." were under way. Before her first visit to Westinghouse, she wrote a blog post at JuniorTheatreProject.org that said: "I was told that the biggest tragedy for these kids is that they see no possibilities happening for them. Their world view is limited. The footlights are dust covered. The 1,000 seat auditorium has been empty for 10 years. Will the NBC's 'Smash': Make a Musical' project reincarnate this glorious past?" She spent two hours with the local creative team and about 20 students on that first visit, and what emerged, she said, were possibilities. Funding and stable school and community support will be keys to sustaining an annual musical theater performance, but the presentations of "Fame Jr." have opened the door to what can be. "It is a school that has been through so many changes but it has all that great history," Ms. Ripley said in a phone interview. "When I first worked with those kids, they had so much personality, so much enthusiasm. They came in on their day off and they didn't want to leave. It was like we had opened up a little hole into the outside world of possibilities and using their abilities to accomplish that. The second time that I went, they had already started on 'Fame,' they were working with Bridgette [Perdue] and you could tell the link they'd made with the people from the Kelly-Strayhorn." Big Beaver Falls Area Middle School is the second school from Western Pennsylvania to be picked for the project. Out of 1,000 applicants, it was one of 10 schools to get more than 10,000 online votes for Phase Two of the program. Yvonne Sterrett, the middle and high school choir and music director, said she was spurred to apply for the program because budget cuts had eliminated arts programs for grades six through eight and there hadn't been a musical at the middle school for six years. Timothy McDonald, founder and leader of iTheatrics, described musical programs in schools as "educational super food; it would be kale if kale tasted like Cinnabon." He said each of the initial Make a Musical schools gave a performance of some sort this year. Mr. McDonald worked with five schools in the program, including a New York school in the shadow of what was the World Trade Center and at Place Bridge Academy in Denver, which serves a primarily refugee population representing 30 different languages and children "displaced by war, famine, terrorism and other atrocities." He also visited an Oakland, Calif., school in a high-crime area that was doing well in standardized testing; the administrators wanted more. "The didn't want them to be robots," he said. "They knew the only way to continue and get the kids into college, which was the goal, was to use the arts to educate the whole child." Ms. Ripley said she "would have given anything to be there" at Westinghouse when "Fame" was presented last week. She expressed how moved she was watching the students take over the stage as they rehearsed in Westinghouse's large auditorium. "They are almost insatiable for how the arts can fill the needs for something that may be missing from their lives or to show off who they are," Ms. Ripley said. "Even in the photos that I took [for the Make a Musical blog], you can see their personalities come through and you can see there is such a need for it and they are so appreciative, and that's a little overwhelming. They are just very excited and very engaged. For a presenter and a teacher who has seen a lot of situations, it's a pretty amazing place to go."